Americus, April 8. While walking on the sidewalk at the intersection of Lee and Furlow Streets this afternoon, Sarah Margarette Culpepper, aged 11, young daughter of Mr. and Mrs. Charles A. Culpepper, was instantly killed, and her sister, Minnie Sue, aged 3, is in critical condition from injuries received when the car of Mrs. Burt Bowers, driven by her companion, Mrs. Jerry Mugivans, swerved into the sidewalk. Mrs. Mugivans was learning the mechanism of the car when coming down Lee Street, she attempted to turn into Furlow Street. By some manner she lost control of the car, running upon the sidewalk at the street intersection. The little girls who were with their mother attempted to run out of the way of the car, it is stated, but the older child was caught directly in the path, being thrown for several feet and before the machine could be stopped, the left front wheel had passed over her chest. Witnesses to the accident state that the younger child was caught by the running board of the machine, being thrown partially under the rear wheel, which passed over the right arm, crushing it in several places. Charles A. Culpepper, father of the children, an engineer on the Seaboard Air Line railway between here and Savannah, was on his return trip home. He was advised of the accident at Helena, where he was relieved. Certain parties who witnessed the accident stated that the car driven by Mrs. Mugivans was running between fifteen and twenty miles an hour. Mrs. Mugivans, at the Windsor Hotel, is prostrated with grief over the accident. The second child in the awful auto accident of Sunday died Wednesday. The Butler Herald, Thursday, April 12, 1917, Page One. 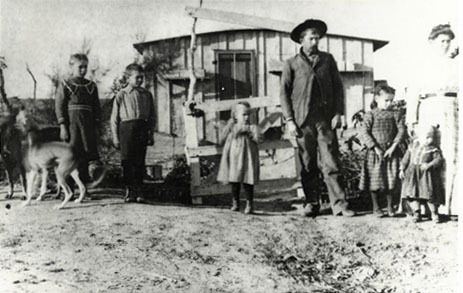 Left to right: Matilda Margarette Culpepper, Otis Francis Culpepper, Mary Ellen Culpepper, Francis Daniel Culpepper, Rosa Mabel Culpepper, and William Lewis (Louis William) Culpepper in front of Mary Ellen (Loter) Culpepper. William A. Pearce, Boarder, M, Jun-1825, illeg, M, UN, ME ME ME. M. E. Culpepper, 14 Feb 1871 - 26 Jan 1915, Mother. Mrs. Otis Francis Culpepper wrote in a 6 Jul 1978 letter: He [Bud] had been in business here since 1923. He had a franchise for selling, first Chevrolet products and later Ford product & last Minneapolis Moline farm equipment. He also has a service station and repair shop for the products he sold. 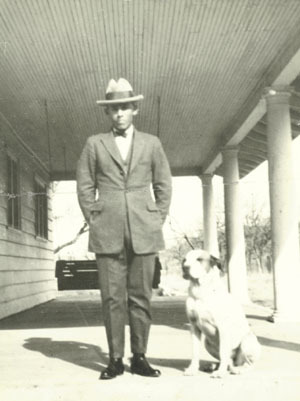 Lee C. Headrick, Boarder, M, 24, S, OK SC TX, Laborer-Farm. E-mail written Apr 2009 to Culpepper Connections from Otis Fancher Culpepper Jr. (#35659), e-mail address. Rosa M. Culpepper, 4 Oct 1895 - 19 Aug 1904. Biography* � Mrs. B. J. (Kathye Culpepper) Garrett, wrote in an 18 Jul 1978 letter about her father's name: He was named William Lewis but, (to the dismay of his oldest sister) he changed to Louis William. This is what you will find on any legal documents. The following obituary is from an unknown Harmon County paper: Last Rites For L. W. Culpepper Held on Monday Funeral services were held Monday for Louis W. Culpepper, 46-year-old county resident who died Saturday at the local hospital.... A resident of the county practically all of his life, Culpepper was a veteran of World War I where he saw overseas service. 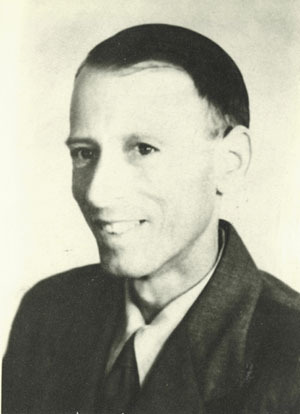 In later years he was engaged in the automobile business in Gould. The family moved to Hollis four years ago. Services were held Monday afternoon at the Church of Christ with Minister A. F. Thurman and Earl Brecheen in charge. Interment was at Fairmount. Surviving relatives include his wife, Mrs. Celia Ellen Culpepper and two daughters, Mrs. Wynnogene Gould and Miss Kathleen Culpepper all of the home address. Also surviving were two sisters, Mrs. George Elrod of Gould and Mrs. W. A. Boyett of Shrewder and three brothers, O. F. Culpepper of Gould and J. H. Culpepper and H. H. Culpepper of Fresno, Calif. Burial services were in charge of Coley's. Kathleen Culpepper, Dau, F, 2 2/12, S, OK TX OK. Correspondence from Kathye Culpepper Garrett to Lew Griffin, 1978. Biography* � Celia was 20 years old when she married Louis W. Culpepper. The cememony was held at the home of the Bride in Hollis, OK and was witnessed by Oralee Cape and Ollie Barefoot. The minister was R. R. Shelton of Gould, OK.
Charles D. Culpepper, Son, M, 2, S, OK OK OK.
Mary E. Culpepper, Dau, F, 3 mos., OK/OK/KS. E-mail written Jul 2006 to Warren Culpepper from James Fancher Rodgers (#21945), e-mail address. E-mail written 2005-2009 to Culpepper Connections from Charles Andrew Culpepper (#35663), e-mail address. Obituary for Jo Sondra Culpepper, 17 Jun 1983. DNA* 7 Jul 2008� Robert has been proven by DNA and genealogical research to be a descendant of Joseph Culpepper of Edgecombe Co., NC, who is a son of Robert Culpepper of Lower Norfolk, the son of Henry Culpepper of Lower Norfolk, VA.
E-mail written Jul 2008 to Culpepper Connections from Robert Daniel 'Dan' Culpepper (#35661), e-mail address.